From an iconic Victorian beachside resort to a potato chip shaped rock to spectacular desert landscapes, these Instagram Worth San Diego spots are sure to make you and your followers swoon. Sun up to sun down, Mission Beach’s Belmont Park has countless photo ops! Ride the oldest wooden roller coaster on the West Coast, The Giant Dipper. Play traditional amusement park games. Sample local brews at Draft or enjoy a sunset dinner at Cannonball, all with a perfect oceanfront backdrop. Capture a moment of serenity at Mission San Diego de Alcala, the first of 21 missions that line the California coast. Have your camera ready as you walk down the same terra cotta halls of the original Padres and explore the mission’s unique history and Spanish architecture. A blooming garden in the spring and summer months frames a beautiful shot of the mission bells. It’s well known that a visit to Point Loma’s Cabrillo National Monument offers incredible views of the city but a short drive down to the beach to the area’s tidepools offers that unique Instagram worthy photo. During low tide, pools form along this shore in rocky depressions where you can get up close to near shore sea life like anemones, elusive octopi and spongy deadman’s fingers. Bonus: Don’t miss the Whale Watch Overlook nearby. It’s the perfect post for spotting Gray Whales during their migration from November to March. Stroll past Lake Poway in North County to explore Mt. Woodson’s unusual rock formations. Up for a challenge? Do it for the Gram and hike four miles to the top of the summit for fantastic coastal views of San Diego at a steep 2000 ft. from the popular Potato Chip Rock. Beat the crowds and rising temperatures in the early morning and make sure to have creative poses ready. Extending 1,942 ft. into the deep blue sea, the Oceanside Pier is one of the longest wooden piers on the West Coast. Snap photos of North County’s pristine coastline or the action during one of many musical and cultural performances at the Pier Amphitheater. 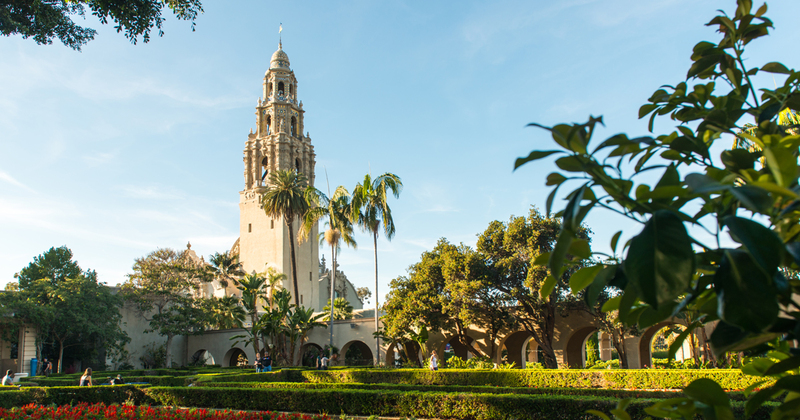 Home to more than a dozen museums, the world renowned Old Globe Theatre , and 1,200 beautifully planted acres, there is no shortage of photo opportunities at Balboa Park . The most photographed areas of the Park are the Rose Garden and historical Botanical Building and a shot of the pond and lily pads can’t be missed. Head east to Anza Borrego Badlands Park to discover the wonders of the California Desert and bask in that out of city feeling. Miles of hiking trails, wildflowers and amazing sculptures create a striking landscape for roadrunner, fox and sheep sightings and a setting perfect for action shots. This iconic red-roofed hotel on Coronado Island is a photographer’s dream. From striking Victorian architecture to glittering beachfront views, Hotel Del Coronado is a historical gem. Private beach bonfires in the summer and Skating by the Sea during the holiday season make it easy to capture the quintessential San Diego experience. Make your way to the picturesque La Jolla Cove to uncover one of the region’s hidden gems. It only costs $5 to descend 145 stairs to the Sunny Jim Cave from The Cave Store and trust us, it’s worth it. Named after the Force Wheat Cereal mascot from the early 1900’s by Frank Baum, the author of Wizard of Oz, the unique formation of the cave and land access make it one of a kind. Capture Sunny Jim’s profile, La Jolla’s crystal blue waters and passing kayakers for a winning shot. There are no bad photos when it comes to capturing San Diego’s Embarcadero. Take in naval history aboard the USS Midway Museum and from inside their helicopter cockpits. Couples can reenact one of the most beloved landmarks in the area at the Unconditional Surrender statue. This entry was posted in Insider Tips by Guest Blogger. Bookmark the permalink.